Heat oil in a pan and then put garlic and pork stir in a pan. 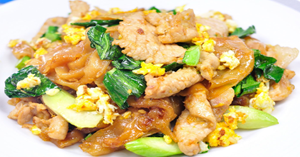 put egg to stir with garlic and pork. put noodle to stir and then put sugar , soy sauce, sweet soy souce and oyster souce. Stir it to combine. put vegetable to stir and then serve to a dish.